21” top step Three Step w/handrail $260. 28” top step Four Step w/handrail $325. 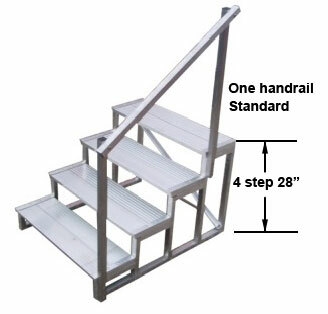 35” top step Five Step w/handrail $395. PLEASE NOTE - We have handled this product for over 15 years and literally sold hundreds. However there can be sharp edges on the corner and water shoes are recommended when using these steps. 1 1/2” aluminum welded frame. Steps & handrail bolt on. in custom made aluminum extrusions. Cross brace across the back for five step and taller. 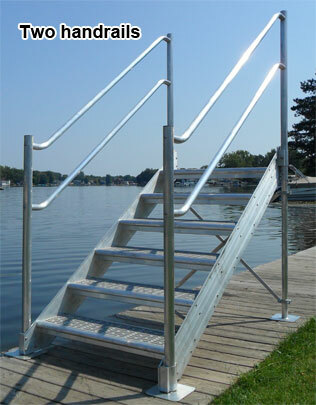 Handrail is 1-1/2” round aluminum with no sharp edges. No sharp edges anywhere, safe for bare feet. * Mounts to dock. Add back legs for free standing use. 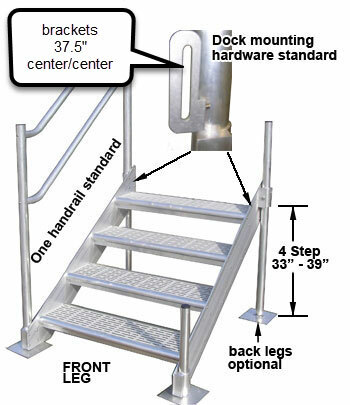 Front legs adjust up to 18"
SHIPPING Bolt to Dock Steps CANNOT be shipped via UPS/Fed Ex (main frame is too large). They must be shipped via commercial truck freight. We will ship 3 and 4 step steps to a commercial address anywhere in the continental USA for a flat rate of $125, 5 and 6 step steps $200. SORRY no Alaska, Hawaii or Canada. Back Legs for free standing application. Additional handrail (one standard) $75.